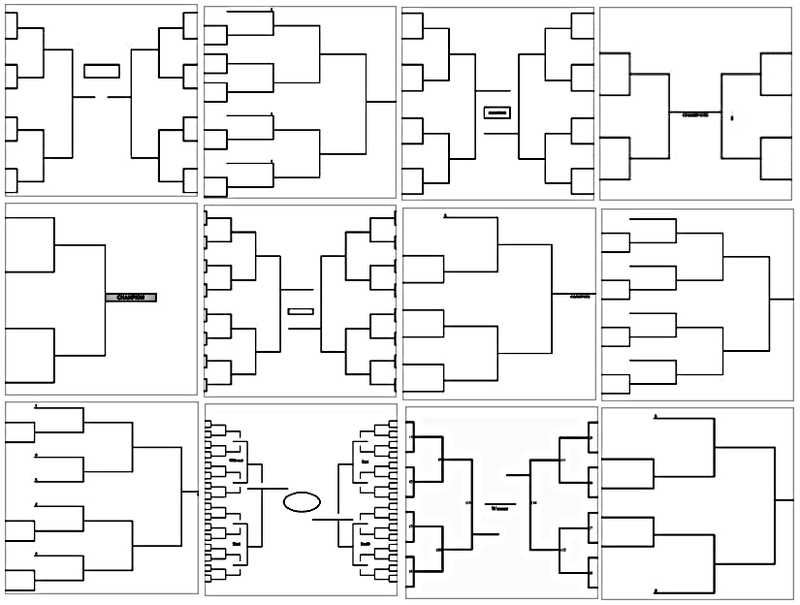 So you’re running a tournament and at the point of putting together your tournament brackets. you’ve come to the right website, Interbasket has specialized in brackets for nearly a decade; designing and creating simple, printable and blank tournament brackets that are a breeze to download, view and print out. Read on to download and print blank tournament brackets. What is a Single-Elimination Tournament Bracket? A single-elimination tournament bracket matches up the number of teams in several rounds of games until there’s only one team standing. A bracket contains a minimum of four games,, but usually the tournament field contains many more teams. Tournament rounds are determined by the amount of teams – the more teams there are, the more rounds there are. Once a field is finalized and properly seeded into the tournament bracket, then the game action can begin. Depending on the amount of teams, the opening round can be an initial round of play-games where the top seeds receive a bye. From a management perspective, the ideal tournament wouldn’t have play-in games and every participating tourney team would have an opponent from the get-go. For a better understanding of how the number of teams impact the flow of a tournament, we created this quick reference table. Look at each tournament bracket’s attributes (total rounds, play-in games, etc.) and how that changes depending on the amount of teams in that tournament. As you can from the above table, how many teams a single-elimination tournament has can simplify or complicate a bracket. If one team drops out, it can have a positive or negative affect on the flow of the tournament. It’s no coincidence that the brackets with 4, 8, 16, 32, and 64 teams don’t have play-in games or any byes whereas any other amount of teams between 4-64 will have at least one play-in game and one bye.